Good evening! Tonight Brian and I tried an after-work run downtown. It was fantastic! The temperature was a good 10* warmer than it was this morning, we were still in "go" mood from being at work and, best part, we weren't trying to drag ourselves out of bed and onto the road. We did a little under a 1/2 mile warm-up walk, 1-1/2 mile run and a 1/4 mile cool-down walk. It was perfect. This was my first 1-1/2 mile run on the road (not the track) since the start of the training program and it felt really really good. For dinner we had leftovers in the fridge for Brian, so I wanted to put something easy together for me. I was still in comfort food mode and wanted something warm and satisfying after being out in the cold. 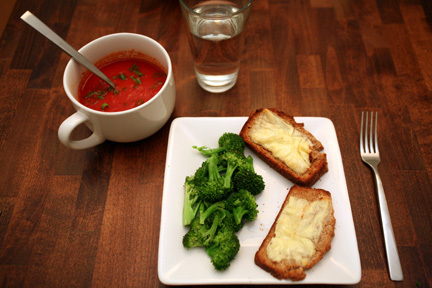 So, I pulled an Amy's Tomato Bisque out of our pantry, a couple of slices of leftover oatmeal bread and some broccoli together. 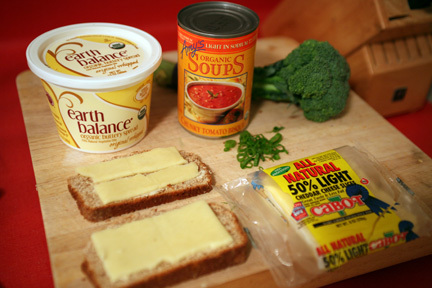 I was going for a tomato soup and grilled cheese kinda thing, so I put 1/2 a slice of 50% reduced fat white cheddar on each of my oatmeal slices and broiled them in the oven. The cheese didn't melt very well...it kinda looked like plastic wrap while it was in the oven. Scary. I also steamed some broccoli and added a sprinkling of sea salt to it. 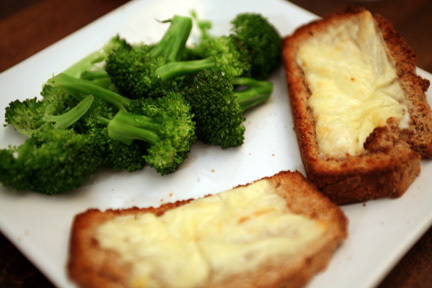 I don't understand why restaurants put butter or cheese on broccoli, its natural flavor is so great and perfectly enhanced with a bit of salt. Yumminess. 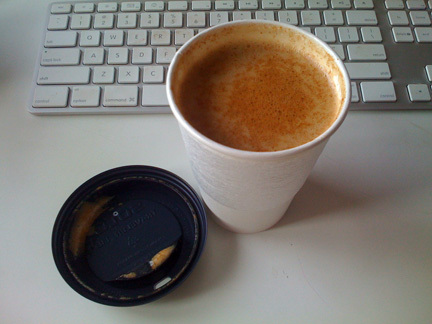 The Amy's Tomato Bisque is pretty good. Its definitely not homemade, but I just didn't have the energy in me tonight. 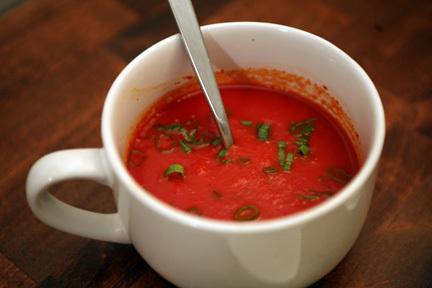 I'll do a tomato soup soon though, I've got a couple of recipes that I love and now I'm in the mood... 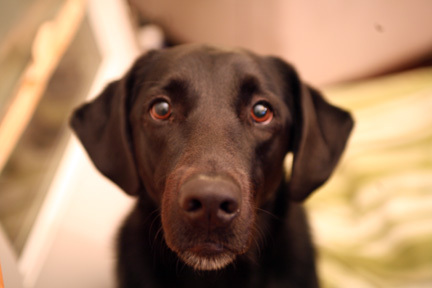 This meal was really filling, I only finished 1-1/2 pieces of the bread and about 3/4 of the soup, but I ate all of my broccoli like a good girl... And Lucy was more than happy to finish off the cheese bread for me, how could I resist this face? 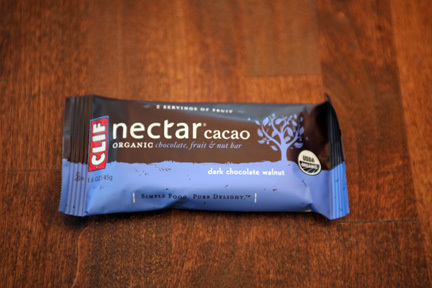 For a snack today I had my Clif Nectar Cacao: dark chocolate walnut about an hour before my run. This bar was SOOOOOOOOOOOOOOOOO GOOD!!! I had never tried any of the Cacao flavors, and sadly this is the only one my Whole Foods carries so it may be the only one I try for awhile. It had a wonderful, dense texture, almost like a really chewy brownie. And big chunks of walnuts! It was a great energy boost for my run and held me over until dinner a couple of hours later. I will definitely be buying these again!! !